Brood II cicadas, a sound and sight to experience this summer. Have you heard the buzz? There’s a lot of buzz, or talk, about a certain insect that shows up once in a long while but in such big numbers that it’s impossible to ignore. But there’s also a sound, a buzzing or whirring that might remind you of a grass trimmer. Yes, we are talking about cicadas: 11/2-inch-long, slow-flying insects with dark bodies and red eyes. Male cicadas are the noisy ones. Their call to females fills the air with a buzzing sound. This year’s batch is called Brood II. (“II” is the Roman numeral for the number 2.) They have been underground since 1996, shortly after they hatched from eggs. (Your parents might remember them or Brood X, which showed up in 2004.) They emerge in May or early June, once the soil temperature reaches 64 degrees. Brood II will appear along the East Coast, from North Carolina to Connecticut, but cicadas probably won’t show up in all Washington area neighborhoods. The heavy numbers are expected in Southern Maryland and outer Virginia suburbs. And by “heavy numbers,” we mean there might be a couple million on your block. That’s a lot of cicadas! Dan Babbitt, manager of the National Museum of Natural History’s Insect Zoo, says there’s no need to worry. Newly planted trees probably should be covered to protect them from egg-laying female cicadas, Babbitt said. Bigger trees may lose small branches but otherwise will be fine. Animals will see them as a tasty, protein-filled treat. Birds, mice, raccoons, opossums and other animals will eat them. “I heard lots of stories of dogs going nuts” in 2004 because they enjoyed the flying snacks so much, Babbitt said. The bugs’ exoskeleton is hard to digest, so animals may get sick if they eat too many. Babbitt says humans, too, can eat cicadas, once they’re cooked. These cicadas aren’t the ones you see occasionally in the middle of the summer. These are periodical cicadas — 15 broods, or groups, that each appear only once in 13 or 17 years. If you aren’t interested in tasting them, Babbitt suggests going out at night as dozens of nymphs come out of their holes and crawl up nearby trees. “Watching that is pretty amazing,” he said. The whole cicada spectacle will not last long. Adults live only four to six weeks. 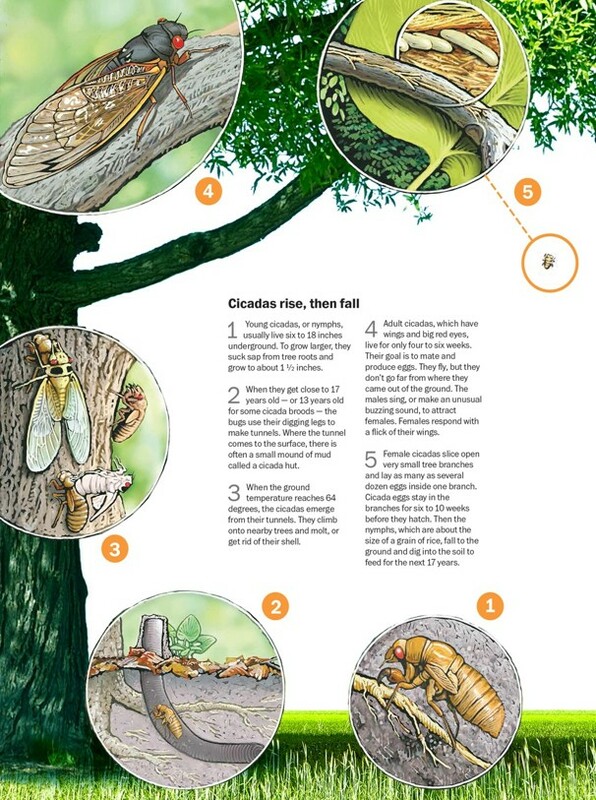 So by mid-July, Brood II cicadas will be history — that is, until 2030.
https://d3bfc4j9p6ef23.cloudfront.net/wp-content/uploads/sites/57/2013/05/09183409/Cicada_stages_online.jpg 813 606 alansinger https://d3bfc4j9p6ef23.cloudfront.net/wp-content/uploads/sites/57/2018/11/07195401/logodark.png alansinger2013-05-13 18:55:392018-11-29 06:24:18Brood II cicadas, a sound and sight to experience this summer. Scott Adams on Green Building Whats So Special About My Electrical Panel ? ?